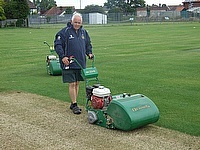 Founded in 1895, Prestatyn Cricket Club in North Wales has had a dramatic history, and over the last 20 years Dennis mowers have helped restore the club's pitch to a standard named the best in the Bridging Finance Solutions Liverpool & District Cricket Competition in 2011. In 1990, the area was hit by the Towyn floods which forced more than 2000 people to be evacuated from their homes when the sea defences failed. To ensure the playing surface at their Euroborg Stadium meets the rigorous quality standards demanded in the Dutch Eredivisie league, FC Groningen have recently enhanced their grounds maintenance equipment with the purchase of two Dennis G860 (34â€) Cylinder Mowers. Cricket Groundsmen will shortly have the opportunity to refresh their education on how to maintain their pitches, courtesy of Dennis & SISIS. 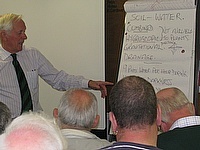 The company are once again showing their commitment to turf professionals by staging a seminar in conjunction with Andy Mackay, host and Head Groundsman at Sussex County Cricket Club, in Hove on Thursday 28th February 2013. 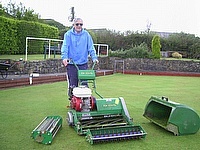 As a county veteran team player, Welsh Bowling Association Advanced Coach and Level 1 IOG qualified Greenkeeper, Montgomery Bowling Club member, Mike Beloe is a man who knows the game, how to care for a bowls green and also achieve the best possible playing surface. 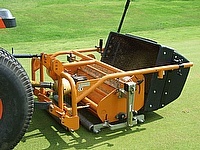 The club has existed since 1783, making it one of the oldest in the country. Responding to popular demand by golf clubs and Greenkeepers on the Isle of Man, Dennis & SISIS recently took to the road again. The company's â€˜Golf Machinery Roadshow' was held at three venues with the Dennis/SISIS team putting together a practical hands-on demonstration of their equipment to a total gathering of over 50 people at Douglas Golf Course. 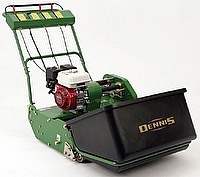 Shrewsbury School Head Groundsman Andrew Richards is testament to the belief that when you find machinery that works, you stick with it and his seventeen years spent using Dennis mowers proves the point. Andrew is keen to pass on this knowledge and experience and earlier this year he was involved at the School with a Dennis/Sisis Seminar & demonstration day when a number of Shropshire Cricket Club groundsmen were in attendance. Award winning Groundsman Rob Brooks relies on his Dennis Premier mower to get the pitch at Alfreton Town FC in the perfect playing condition required for this progressive club. Alfreton Town, based near Derby, moved up to the Conference last season after winning the Blue Square Bet North division, and the more intense training programme required at this level has placed extra demands on the pitch at the Impact Arena. Home to two teams competing in the Marshall Hatchick Two Counties Cricket Championship (Feeder League to the East Anglian Premier League) on Saturdays, the club has a link with neighbours F&CY Cricket Club (U9 to U18). This allows them to play a mixture of youngsters and senior players in the F&CY Cricket Club's Sunday teams, giving the younger players an introduction to senior cricket. Bickford Smith Bowls Club in Camborne, Cornwall was founded in 1931, originally as the ICI Bowling Club but is now an important community resource, with three men's league teams and two ladies' teams, as well as friendly and inter-club matches and competitions. In 1978 the ladies, with the help of the men, organised the annual Bickford Smith ladies tournament, which still runs each year and is still a big success. 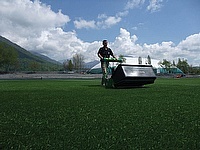 Dennis mowers are set to put in a winning performance at the European Football Championships, known to millions of fans simply as Euro 2012. Hosted in Warsaw, Wroclaw, Poznan and Gdansk in Poland and Donetsk, Kharkiv, Kiev and Lviv in the Ukraine, no less than five of the stadia to be used for Euro 2012 are brand new and purpose-built. 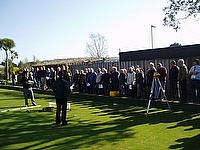 Following their recent highly successful series of bowling green maintenance seminars in the north of England and western Scotland, Dennis and Sisis are pleased to announce their next seminar will take place on Wednesday 23rd May 2012 in Northampton. 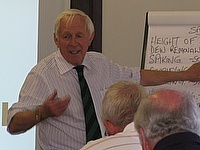 Dennis and Sisis are taking to the road again with their successful seminar format. This time they're giving groundsmen and greenkeepers on the Isle of Man an opportunity to attend a Turf Care Seminar at Ballafletcher Sports Club on Wednesday 21st March.